The biggest shopping season of the year has officially started! This week, many retailers started offering huge discounts, just in time for Black Friday and Cyber Monday. Fashion Studio Magazine will be writing daily about the most interesting online sales and featuring some of our favourite items as well. Stay tuned! 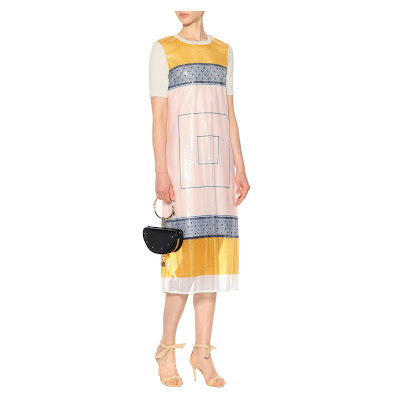 Today, we would like you to get ready for your next tropical adventure and have a look at some of these gorgeous summer dresses by Tory Burch. With the next winter getaway in mind (and stylish wardrobe prepared in advance), it will be easier to survive cold winter months. Happy shopping! 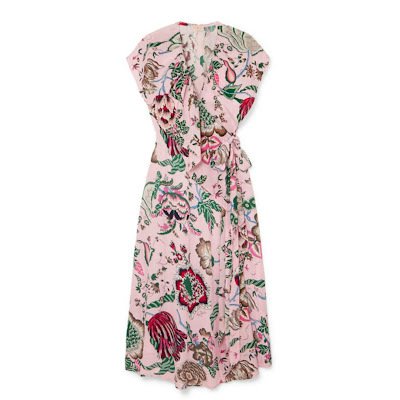 Named 'Happy Times' after the book written by socialite Lee Radziwill, the botanical print on Tory Burch's 'Adelia' dress is sure to lift your mood. This midi style is made from fluid crepe de chine and detailed with ruffles along the flattering wrap front. Wear yours with optic white accessories. Tory Burch's 'Sasha' dress is one of 12 pieces featured in the label's Pre-Fall '18 lookbook. 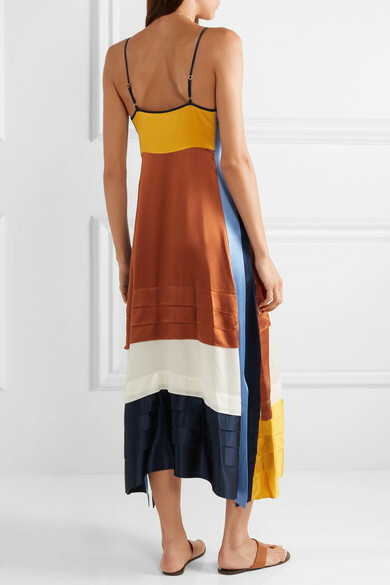 Color-blocked to create a slimming effect, this style is made from silk crepe de chine and has pleated panels and generous side splits that accentuate the asymmetric hem. The plunging neckline is perfect for showcasing your favorite necklace. 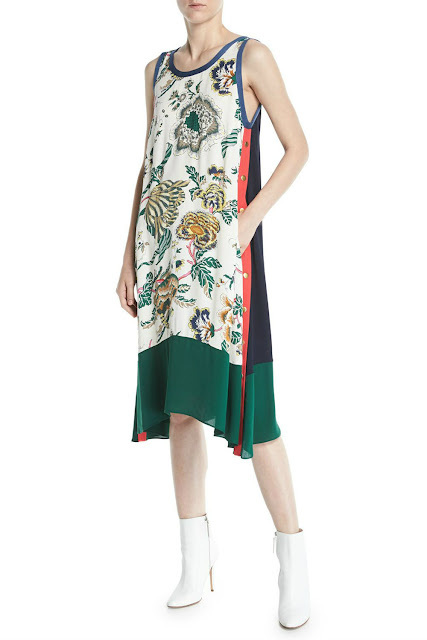 Tory Burch tank dress with floral-printed front and side stripes will look great with white ankle boots or with stylish sneakers. Featuring asymmetric hem and an A-line silhouette which looks great on almost any body type, this flattering dress is must-have item for your winter getaway! 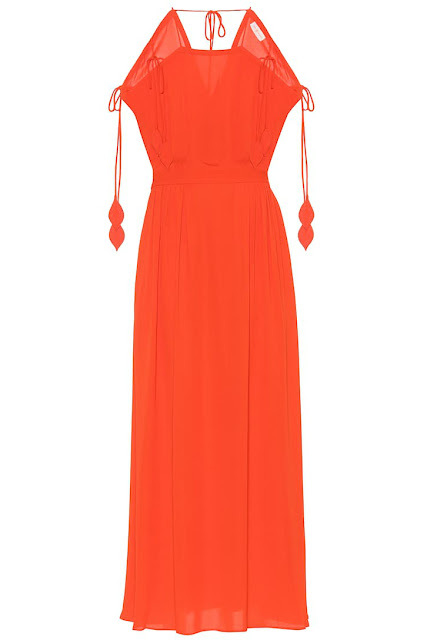 Saturated in a bright poppy red hue, the Evalene dress from Tory Burch channels the label's smart urban bohemia. Crafted from weighty crêpe, the maxi-length style features a flowing silhouette with tie details at the shoulders and behind the neck. We love how the side slits create a moves-with-you look that lets you show off your favourite summer slippers or sequin slides. 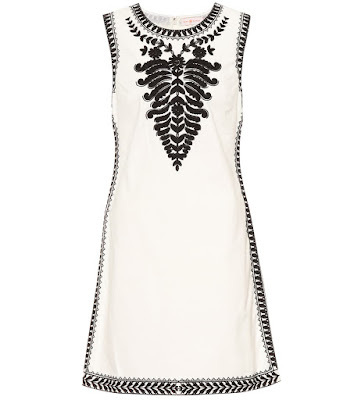 Tory Burch marries the label's preppy aesthetic to Indian influence with this comfortable cotton dress. The sleeveless design has been woven for a natural texture and firm handle, enabling the tunic-inspired silhouette. Rich navy embroidery and beading adds a distinctive finish to this piece – team yours with leather sandals all season long. Tory Burch is an American lifestyle brand that embodies the personal style and sensibility of its chairman, CEO and designer, Tory Burch. Launched in February 2004, the collection includes ready-to-wear, shoes, handbags, accessories, watches, home, and beauty. Up to 60% off sale styles + 30% on off purchases of $250+ with code THANKS.